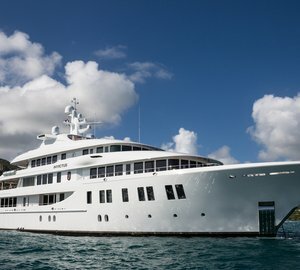 The 50m/164ft superyacht INVADER was built by Codecasa in 1999 and last received an extensive refit in 2019, which saw her exteriors refreshed and her interiors completely refurbished. Her naval architecture is the work of Franco and Anna Maria Dellarole with interiors also from Franco and Anna Maria Dellarole in collaboration with Georgio Vafiadis Studio. The accommodation sleeps a maximum of 10 guests over 5 en-suite cabins, with a crew of 12 to ensure that all guests receive the first-class service throughout the cruise. The main deck aft is a large shaded space for guests to rest out of the sunshine and provides armchairs and footrests. Upper deck aft has an oval alfresco dining table and two sofas along the stern, and there is a walkway on either side with a circular foredeck providing a curving sofa and a table for casual alfresco meals. The sundeck places sunpads forward on either side of the communications mast, with the port side also furnished with a C-shaped sofa and a raised Jacuzzi. To starboard there is a wet bar and a circular table is placed amidships for alfresco dining. A davit crane is placed to starboard for the launch and retrieval of tenders and larger water toys, and sun loungers line the stern. The beautiful interiors feature light contemporary styling with modernist artwork in the main salon and skylounge. The lower deck hosts the crew accommodation, mess and facilities forward with the guest accommodation placed amidships around the central staircase to the other decks. Behind is the engine room and the tender garage takes up the stern. 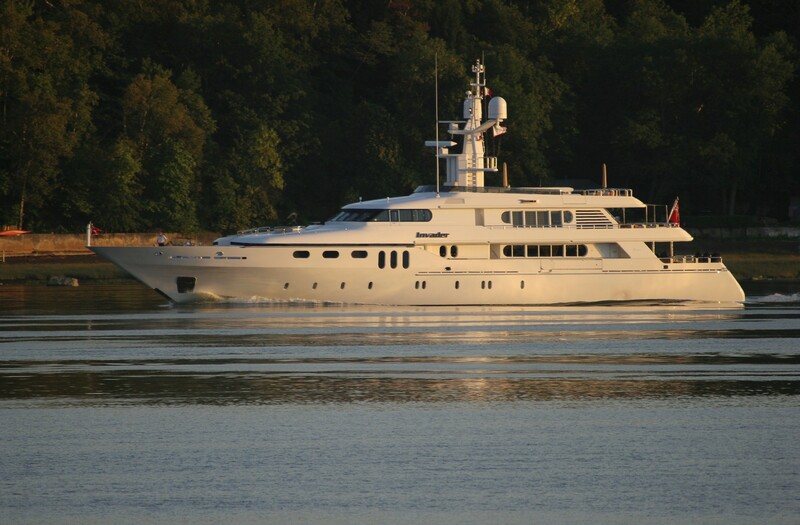 On the main deck, the Master suite is placed forward with the galley amidships to port and the main foyer opposite. The aft section has a large formal dining table to seat all guests for a special occasion, and behind there is a spacious lounge with a forward-facing sofa and armchairs placed around a coffee table. 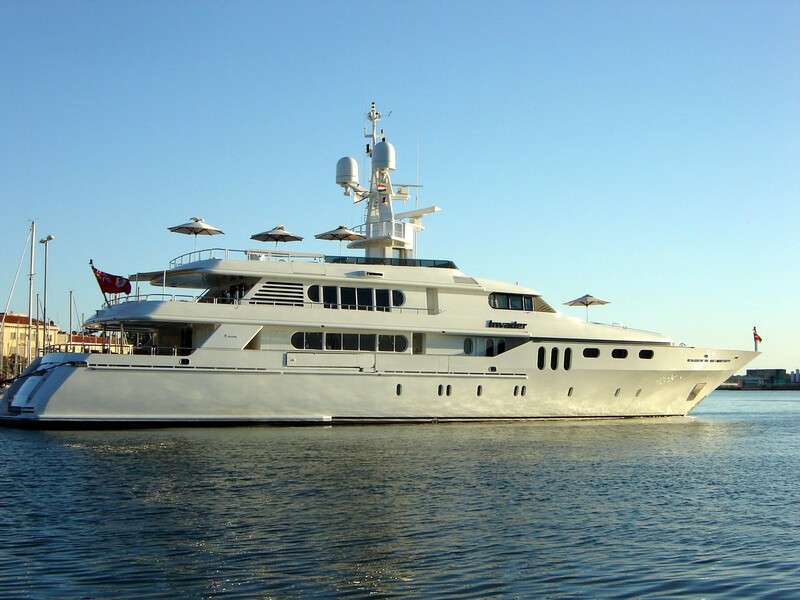 The helm controls are located forward on the upper deck, and there is a sofa to starboard within the room for guests to watch the action or use the space as a second cosy lounge while at anchor. The Captain's cabin is immediately behind followed by the sky lounge, which treats guests to a comfortable seating arrangement comprised of a widescreen TV mounted within the forward wall, a large seating area with a sofa and armchairs to port and a more intimate seating area to starboard. A wet bar is placed behind and a games table opposite. A pair of 2,200 Caterpillar HP 3516 B provide a maximum speed of 18 knots, a cruising speed of 15 knots and an extensive cruising range of 5,500 nautical miles. The accommodation sleeps a maximum of 10 guests across 5 en-suite cabins: 1 master suite, 2 double cabins and 2 twin cabins both with a Pullman berth. ~ The Master suite is placed on the main deck forward and is accessed through the private starboard office. The bedroom is furnished with a desk to port of the king-sized bed and a sofa beneath the starboard window. There is a large wardrobe behind and the forward bathroom has two entrances with both sides providing an enclosed toilet and bidet, a sink and a shared central bathtub/shower. 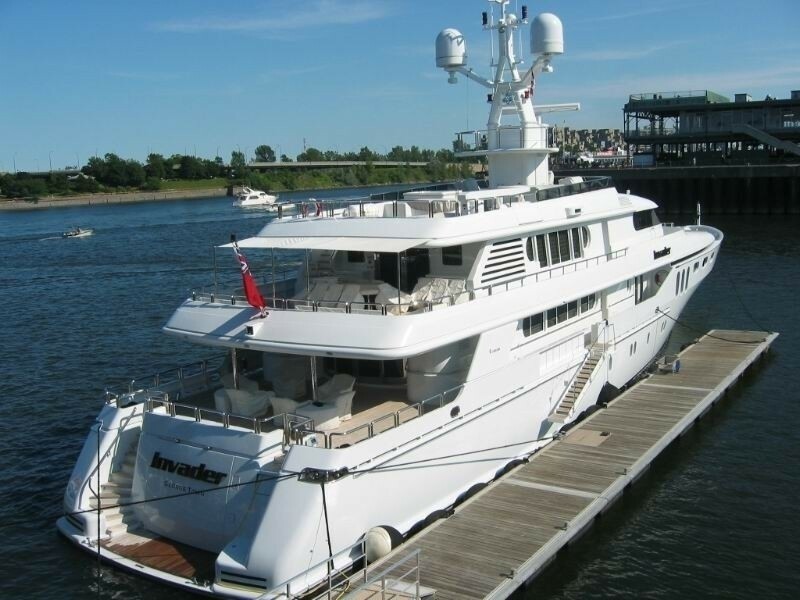 ~ The lower deck has two double cabins aft of amidships and each has a deck and wardrobe in addition to an en-suite bathroom with a toilet, bidet, sink and bathtub. The twin cabins amidships both have a Pullman berth, a wardrobe and a bathroom containing a toilet, bidet, sink and shower.